Rarely does a kicker get mentioned by football analysts in pre-game shows. Their job is a lonely one. 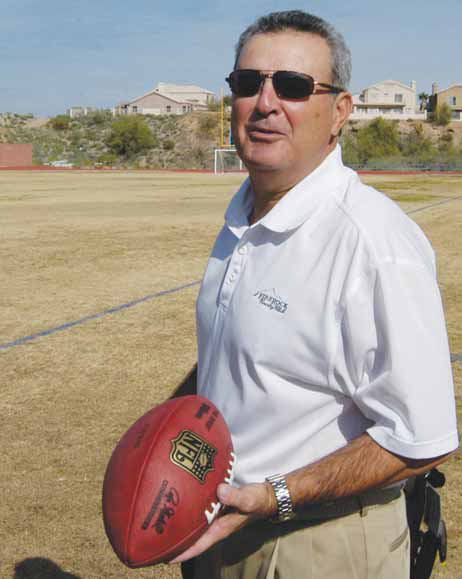 But for Fountain Hills resident Gary Zauner, he’s in good company. The kickers he’s become acquainted with have achieved much success between the uprights. For this kicking and special teams coach, he’s built a reputation on helping kickers achieve elite status. Names like Gary Anderson, Eddie Murray, Nick Lowery and Jeff Jaeger. When Anderson finished the first perfect season by an NFL kicker in 1998 it was under Zauner’s tutelage. But had it not been for Zauner’s persistence, the NFL might not have seen his coaching prowess. First Down Zauner says he had a passion for kicking and punting at an early age. In Wisconsin he won the local and regional punt, pass and kick competitions. From there he played in high school, excelling as quarterback, punter and kicker. As he became profi cient at kicking, several colleges took an interest. Zauner decided on the University of Wisconsin La Crosse, where he played football, baseball and basketball. After the kicker in front of him was drafted by the Washington Redskins, Zauner was the kicker and punter for two years. After graduation he signed as a free agent with the Minnesota Vikings in 1973. The following year he signed with the then Houston Oilers. It was there his NFL career as a player ended. Determined to get back into professional football, Zauner sent letters to 125 Division I schools. He got just one response, but that was all Zauner needed. Brigham Young University Coach LaVell Edwards wrote and said he was intrigued with Zauner’s credentials. LaVell said he always thought punters and kickers were left out and offered Zauner a graduate assistant job in charge of special teams. In his fi rst season there BYU had the nation’s leading punter, Clay Brown, with a 45.3-yard average and the nation’s leading kickoff return team with a 26.3-yard average. The following year the special teams were turned over to Zauner. And in the culmination of his time at BYU, he was part of one of the greatest comebacks in bowl game history. Down 45-25 with less than three minutes to play, BYU rallied to beat Southern Methodist University. And it would be the special teams playing a signifi cant role in the win. As BYU fans began leaving the Holiday Bowl stadium in San Diego, Jim McMahon threw a quick touchdown pass and BYU recovered an onside kick. The Cougars scored again on a 1-yard touchdown run. The BYU defense forced the Mustangs to punt on the next possession, and then blocked the punt with 13 seconds left in the game. The Cougar offense took over at the 41-yard line, and scored on a Hail Mary pass into the end zone as time expired. Then with the score tied, BYU’s Kurt Gunther kicked the extra point to give the Cougars a miracle 46-45 victory, scoring 21 points in the last two minutes and 33 seconds of the game. Zauner says his time at BYU “validated” what he was doing with high school kickers was now working at the college level. And ultimately it propelled him to being recognized as one of the top special teams coaches. Where ever Zauner went after BYU, kicking success followed.In 11 years in college he coached nine all-conference punters and kickers, most of whom, Zauner said, were walk-ons. By the 1990s Zauner was regarded as the best individual kicking instructor in the country, tutoring and coaching some of the best kickers and punters in college and the NFL. While he worked as a kicking consultant to many NFL teams, he didn’t get his first full-time NFL coaching job until 1994. Zauner was hired as the special teams coordinator for the Minnesota Vikings. Now after 13 seasons in the NFL, Zauner is opening up his expertise to the world, launching a website that will soon have a video on his coaching techniques.